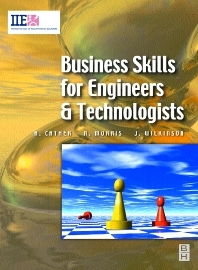 This essential text is part of the IIE accredited textbook series from Newnes - textbooks to form the strong practical, business and academic foundations for the professional development of tomorrow's incorporated engineers. Harry Cather started as an apprentice Mechanical Engineer. His initial studies were part-time and concluded in becoming a C.Eng through the Institute of Production Engineers (now amalgamated with the IEE). He continued gaining knowledge, partially through courses, experience and other learning processes leading to an MBA and MSc. Being a “good” engineer, led him to study management in addition to engineering and he is a member of CMI and an associate member of IBA.Before joining the University of Brighton, his career was in support functions from Industrial/Production Engineering through Project Management to Workshop Management. In addition to engineering, he has worked in a wide variety of industries from mining to food, including three foreign postings.He is involved in TCS schemes and has carried out assignments for BESO, a volunteer organisation that assists in transferring technology to developing countries.Harry has recently set up as Industrial Consultant and welcomes any queries at harry@consultca.co.uk.